Yup, I'm doing something I never thought I'd ever do. I'm becoming a CDL instructor! Long story short, an old college buddy of mine started asking questions about becoming a truck driver. After several emails and a couple phone calls together, he applied to the company I drive for and was hired. He's coming in without any trucking experience and no CDL. After a lot of thinking, I decided to train him myself. This will probably be my first and last student, but we were very good friends in college. I know the guy pretty well and know we will get along. Training perfect strangers, however, isn't something I'm up for. Right now, I'm going through training to become a certified CDL driving instructor. After that, I'll hit the road with my student. This is a very unique CDL school in that training is done with 1 on 1 instruction, in the real world. While he's on my truck with his CDL permit, we will be making deliveries, driving on expressways, city driving, and anything else that truckers do on a day to day basis. During slow periods, we'll practice backing skills and study for the pretrip exam. This will last about 3 weeks or so, at which point he will test out and obtain his full CDL license. 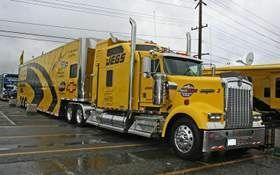 Then, he'll be placed with a company trainer to complete 30,000 miles dispatched as a team operated truck. While I have the ability to do this part of the training as well, I'm only going to do the CDL portion of the training. I just can't get comfortable with the idea that I'd be sleeping while a brand new driver who just obtained his license is driving. I'm going to make a few blog posts about becoming a CDL instructor and the challenges I face while training a new student. My hope is that it will help new drivers understand the stress and challenges that CDL instructors go through. Trucking companies that train new drivers face a huge challenge. Unfortunately, some bad trainers and instructors get into the mix. Many drivers hold the company at fault, instead of the individual trainers. Without a doubt, the company I'm with does everything within its power to keep bad drivers out of the training system. I have every reason to believe most other companies do the same. But in the end, there is only so much they can do. As an example, I had to sign a detailed contract in order to become a trainer. The contract specifically states that my primary reason for doing this is to help train new drivers and not simply for the money. Obviously, they expect that a certain aspect of our motivation to train is for financial reasons (the pay is VERY good), but they want to make sure that is secondary. We had to specifically state that we are doing this on our own free will and that we aren't doing it because our dispatcher persuaded us to do it. They really are seeking drivers who want to do this, not drivers who feel they were forced into it. They emphasisthat we are not a boss and we are to treat our students with mutual respect. While we are expected to take a "leadership" roll and do what is necessary to facilitate a safe training environment, our trainees aren't our slaves. In fact, they don't even like using the term "trainee" anymore. They much prefer "apprentice." Do I expect my apprentice to listen to me and do what I say when I say it? Absolutely. Do I have a say in whether the company should actually hire the driver or not? Yup, sure do! But there is a fine line here. Some trainers begin to feel a sense of power and get out of control. The contract I had to sign, and the lectures I had to listen to, tells me this company is doing everything possible to make our trainers into leaders and not power hungry dictators. By signing the contract, I'm also required to keep my truck clean and in safe operating condition. I'm also required to maintain good personalhygiene (party's over! )and supply my apprentice with showering facilities a minimum of every 48hrs. However, we are expected to make every effort to supply a shower every 24hrs. And that is what I prefer anyway! Our trainees (oops! I meanapprentice) is to be guaranteed 15 minutes of privacy each week to check in with a fleet manager. This will allow them to complain about me in private if they want. After training, I'll be fully evaluated. So anything I've done wrong can be exposed to my dispatcher and management. There are many more details of this contract, and I've heard a lot of lectures the past couple days. But my main point for writing all of this is that these companies do care about the quality of their trainers. In addition to meeting minimum safety, service, and experience requirements, they really make a big deal out of being a professional trainer. Just how important are qualitytrainers to the company? Well, the owner himself came to speak with us about it. And that's only after the safety director and the director of training came to have their say. Bear in mind, this is a billion dollar trucking company with over 4,500 trucks. Every week, these upper management individuals come to speak with new trainers, stressing the importance of a positive training environment. Even after all the lectures and contracts, bad trainers still make it through. There will still be trainers who only do it for the money. There will still be trainers who yell and scream at their students (whoops! I meanapprentice!). There will still beunprofessionaldrivers who are training, that have no business teaching anyone. This is simply the nature of the beast. If you ever have a bad CDL instructor or company trainer, speak up! There's no way the company can know about it until somebody says something. Otherwise, these poor trainers will continue to train until somebody does say something. There's a misconception out there that large trucking companies make money off of their CDL training programs. This isn't true. We were actually shown the insane costs of running a CDL program and the revenue generated. It's very much lopsided. Fact is, large companies need drivers. Lots of them. And the only way to insure a they fill drivers seats and grow their driver base is to train new drivers from scratch. These companies are making aninvestment and they don't see their return on investment for about 1 full year after a student passes their CDL exams. These programs aren't cheap, and they want you to pass. The rest of this week, I am required to take and pass all of the CDL exams that any new driver will have to pass. Today, I took the pre-trip exam. Tomorrow, I'll be on the training pad performing all of the driving and backingmaneuversnew slaves must take. Wait. I meanapprentice, not slave. This is going to be tougher than I thought! Once I've passed everything, I'm ready to hit the road and make my old college buddy a real life trucker! So stay tuned! This is a whole new experience for me. I'm both excited and nervous about it, but at the very least, I'll be able to share what training is like, from a trainers point of view.